While calves and sick individuals may sometimes be taken by sharks or killer whales but generally, they don't pose a threat to large, healthy baleen whales. 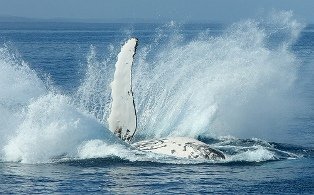 However whaling, particularly in the last century, cut their numbers down by 90%. Another human-caused threat is water pollution which causes a huge amount of different diseases and death.